This image of a circular depression on the surface of Mars was acquired on Jan. 5, 2015 by the High Resolution Imaging Science Experiment (HiRISE) camera on NASA’s Mars Reconnaissance Orbiter (MRO). The spacecraft has been orbiting Mars since March 2006 and completed its 40,000th orbit around Mars on Feb. 7, 2015. HiRISE is one of six instruments on the Mars Reconnaissance Orbiter. 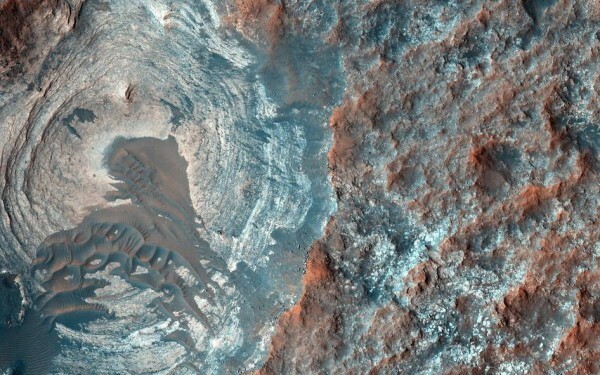 The University of Arizona, Tucson, operates HiRISE, which was built by Ball Aerospace & Technologies Corp., Boulder, Colo. NASA’s Jet Propulsion Laboratory, a division of the California Institute of Technology in Pasadena, manages the Mars Reconnaissance Orbiter Project for NASA’s Science Mission Directorate, Washington.